The Maiden's Tower (Turkish: Kız Kulesi) is a tower located at the southern entrance of the Istanbul Strait (The Bosphorus) and 200 m (220 yd) off the coast of Üsküdar (Salacak shore to be exact) in Istanbul, Turkey. Maiden's tower history dates back to 5th century BC. it was built on a small rock in front of Chrysopolis (today's Uskudar) by Athenian general Alcibiades on a rock at the entrance of the Bosphorus for the surveillance of the waterway and used as a customs area for ships passing by. The tower was later enlarged and rebuilt as a fortress by the Byzantine emperor Alexius Comnenus in 1110 AD. In 1509, the tower has survived one of the largest earthquakes that took place in Istanbul. Due to the earthquake the tower was damaged. Sultan Selim I, restored the tower and turned it into a lighthouse. During the conquest of Istanbul (Constantinople) by Ottoman Empires, the tower was used The Venetian fleet as a naval base to help the Byzantine army. After the conquest, Mehmet II (Fatih aka The Conqueror) and built a small fortress and placed canon balls nearby. The tower was used as a performance platform rather than a defense tower. Several occasions and messages such as Ottoman navy’s arrival from war, the beginning & ending of Ramadan, the coronation of the Sultan were announced from here. The tower was restored by Sultan Selim after the big earthquake in 1510. A wooden lighthouse was built in the tower to help the sailors in 17th century and. In 1719, the wooden tower was badly burned by the fire used to guide sailors at sea due to stormy weather, and was repaired again in 1725 by the head architect, Nevsehirli Damat Ibrahim Pasha. When the epidemic cholera showed itself in Istanbul 1830, the tower was used as a quarantine facility for those affected with cholera. As breakouts of the cholera faded, the tower was able to resume its former job as a lighthouse. The most recent restoration began in 1998 for the James Bond movie The World Is Not Enough, and steel supports were added around the ancient tower as a precaution after the 17 August 1999 earthquake. 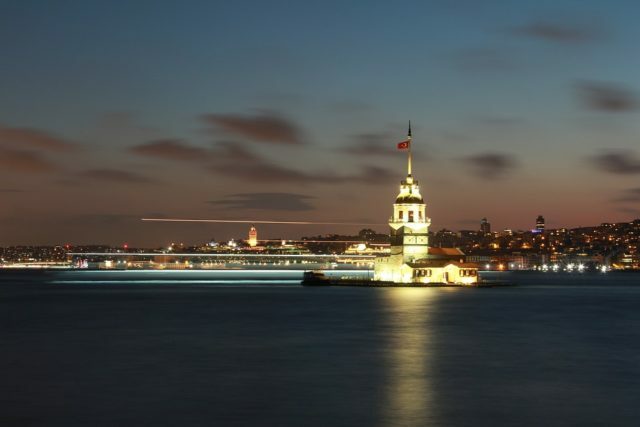 Served as a lighthouse for centuries, in 2000, the interior of the tower has been transformed into a popular café and restaurant and maiden's tower welcomes its guests with an outstanding view of the former Roman, Byzantine and Ottoman capital. Once upon a time a fortuneteller tells the king of the city that his daughter will be killed by a poisionous snake on her 18th birthday. In an effort to prevent the early death of his daughter, the king keeps his daughter in a tower he built on an islet in Bosphorus. When her daughter becomes 18, the king brings a basket of lavish fruits as a birthday gift. However, a snake hiding in the basket comes out and bites the king's daughter and gets killed as the fortuneteller predicted. There is also another story. This story does not exactly pass in the Bosporus. It actually takes place in the Dardanelles strait but due to the vicinity and similarity between the Dardanelles and the Bosphorus, Leander's story was mistakenly attributed to the Maiden's tower. This story is about two lovers, Hero and Lavender. They live across the different sides of the Dardanelles strait. Hero in a tower at Sestos and Leander (Leandros) at Abydos. Leander swims across the strait every night to see Hero. While he is swimming Hero guides him with her light but one night Hero's light was blown out by the breeze. Leander cannot find his way and drowns. Hero cannot bear the pain and ends her life. Maiden's Tower is featured in famous game Assassins Creed: Revelations.